Twitter has always been good for getting immediate answers to the most esoteric questions. Usually it is someone who is following you who supplies the answer, and those are always the best ones. But Q&A sites also want in on the supplying answers to people with questions on Twitter. One of the biggest Q&A sites on the Web, Answers.com, now offers answers to anyone who Tweets a question to @answersdotcom. (The @answers account is owned by Mahalo, which has its own rival social Q&A service on Twitter which routes questions to humans). 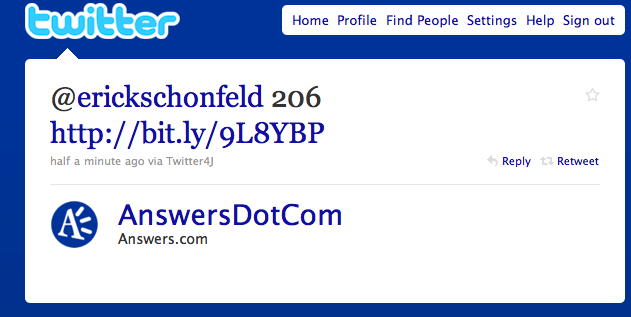 When you Tweet a question to @answersdotcom, you get a reply almost immediately which is the top answer from the site, or from WikiAnswers, which it also owns. @Answersdotcom does best with trivia or factual questions. Ask, How many bones are in the human body? It comes up with 206. Or, How many people live in France? It estimates 65 million. But if you ask, What wine goes with lamb?, apparently nobody has ever asked that on Answers.com. Ah well, there’s always Aardvark.